I didn't pay $60 to for an imcomplete experience. I shouldn't HAVE to wait for the content because of Nintendo and the Devs being terrified of the game's online longevity. Why did you pay it then? Found on Reddit this that explain well my though. Considering that Nintendo aren't actually gaining any money from this method of slowly trickling out Maps and weapons, I don't see how people are jumping to the conclusion that they are being shady. Actually, it probably requires more effort on their part. Surley this method of extending the life of the game is a good thing for players? It's a way of insuring the game doesn't die in a matter of months and make on-line useless which is important considering it is a new Ip on what is widely regarded as a failing console. What makes it even less of an issue is that Nintendo made everything blatantly clear about what they were intending to do as well. Even at that, people can just choose to buy the game when everything is released anyway so I honestly don't see any reason to complain. Then buy it when that content is unlocked. This isn't rocket science. I've already explained why the content isn't just rolled out to sustain player activity (setting aside the whole fact that people complaining about the rollout seem to have no problem with the elephant in the room of lacking population being an issue) - Splatoon is constantly introducing more advanced gadgets and complicated designs that in time would create a huge barrier of entry for a newcomer considering how new of a concept it is and how reactionary people are to any new set of combinations and how it changes the meta game. The developers have been as transparent as it gets in regards to what has been there on launch. I've had my fair share of reservations towards some of Splatoon's content management but if you paid $60 in spite of knowing fully well how the rollout was going to work, then I'm sorry but that is sorely on you. Complaining about not everything being available at once when stuff is being unlocked in a steady pace is being impatient. It's completly fine to be against this practise, but calling it Anti-Consumer is BS. At best this is Anti-Completionist. Yep. Not only that, but everything is online related, no actual downloads. So, even if they allowed for every weapon and map to be used on day one, is not like you'll be able to use any offline, or whenever the servers are shutdown. Some are disappointed and even raging, because of the idea that when they shutdown the servers, they won't be able to use said content, when even if everything was unlocked day one, they still won't be able to use them after the shutdown. One thing I didn't see mentioned that was on the guy's twitter is that he found references to S and S+ ranks. S ranks would be awesome. I feel that even in A+ rank there's often a huge discrepancy in skill, leading to really one sided matches. Close back and forth matches are the most exciting moments in this game for me. Many skilled players adapt the weapon set to the current map rotation. Thats true. I've been trying out the snipers whenever Bluefin Depot is on with decent success. It seems like Nintendo always knows what's best for the players. They know it is better for them not being able to talk to each other online, they know it is better for them not being able to team up on the same side and now they know when players should be allowed to play content they already have paid for. If a game is good, the community will keep playing it. Somehow, other games manage to do it with more content from the start. I don't know, maybe it's just me coming from a PC background with shooters having hundreds of mutators/mods and still manage to have a healthy community. Can't players decide for themselves anymore? Hence the "minor issues" comment I put there. I realize what may be minor issues for me may be major issues for others, but you have to realize that the Wii U has an abysmal install base for its age. Yeah, it's mostly Nintendo's fault, but the game was released and it has to deal with it. I can't speak for PC since I only own weak ones, but I imagine they have a community comparable to the PS4 or better. Aren't shooters one of the more popular games to play on PC? It's up there IIRC. Yeah, I've heard the argument about the game being good should keep the community going, but have you seen how shooters do on the Wii U? It's not pretty. Combined with the risk of launching a new IP on a console that isn't selling great, can you blame them for having some fears? I'm not saying the solution is the best solution, but it's a decent one. The voice chat and personal lobbies are legitimate issues that affect people differently, but the content rollout is so that people don't abandon the game too fast and go back to Mario Kart, Smash, etc. Some people have issues with this, but I don't, especially since we can get pseudo-GAF rooms going. Those are always fun. ...Maybe I'm explaining myself wrong. I dunno. They're not. You don't download anything. You get online, and said maps are added to the rotation. So, even if a million maps were in the rotation, you'll only see and use them online. My suspicion of those complaining is that they have not actually played the game and do not have a full understanding of Nintendo's implementation of these ideas. I think constantly adding to the experience has engendered a great sense of community that could not have been accomplished any other way. All these news sites shouldn't refer to it as free content. So, wait, I have a question for all the anti-consumer folks in this thread: how is this benefiting Nintendo exactly? If anything the game's critical reception suffered because of the lack of content at launch. Had they rolled all this stuff them, I'm certain the game would have received a much higher metacritic score, which we all know impacts sales. You might say that this gradual roll-out keeps players engaged. However, these are the same players that felt the game was worth full-price at launch. Considering the content is "free," this benefit doesn't offset any lost sales due to the perceived lack of content/good-but-not-great reviews. The most you could say about this is that it's a bone-headed business decision on Nintendo's part. I mean, I wouldn't go that far personally, but I think they could have struck a better balance between pre- and post-launch content. To call this "anti-consumerist," "shady," or the like is just disingenuous in my eyes. As for me, I honestly don't see what the big deal is. The game has kept me satisfied since launch. The slow roll-out has encouraged me to try out new weapons, and truly master each map. I honestly get excited when they announce new stuff. I guess I'm just a sap? Do we have any proof that the content is complete? What? Have they ever said that? Several of the stages that have been added have already been used in the single player campaign and none of the unlocks so far have required additional DLC or patches to download. Only one patch so far has updated the version of the game. The game probably checks for an online trigger/alarm and if it's detected, a new stage/weapon etc. becomes available. Nope. They've only described it as "free content / update events". It's never been advertised as DLC. The content released so far has just been unlocked, without the need to download anything. But I doubt that the additional modes are already on disc. They had nothing to show for the Rainmaker in the Direct. And the other one was barely shown. Wasn't EA charging people money for those? Only for used copies, if you bought it new then you didn't have to pay for the access. They eventually made it free for used copies. This isn't all the free content though. There are still additional maps that are being worked on. The Triple Red Shells of Splatoon. Will be my main weapon. Yeah I'm not about to dispute that. For one thing, the Splatoon Direct seemed to imply that by the end of the summer there should be at least 14 maps, and if 10 is all there is on the disc then there should be more. So there's probably a lot more to it in terms of what's complete there and what isn't. It's kinda like what Animal Crossing does, except you can't abuse the system clock to get stuff early. nintendo was very clear from the start that the "complete experience" would involve waiting for maps and game modes to come into the rotation. You and everyone else were armed with the knowledge necessary to make the purchase decision. what's the problem? this game isn't for you. 50% of the content locked away for on-disc DLC. what a joke. so glad i didnt buy this game. You don't like TV shows too? Because seasons has been finished before they show them weekly. But if you want you can buy the full season after all episodes have been shown, it is the same with Splatoon. Yeah, that sounds like a really great game. Yes, it is! And it's extremely addictive. Soon 100 hours in that game. How is the single player? It's really great, but a bit on the short side. The last boss battle is epic. I really wish they gave us all on disc maps and features to us at launch rather than ease them out. I would probably still be actively playing the game. Also wish they'd get rid of the map rotation, it's dumb. You can play the single player just 2 hours per day. For the rest you play 2 maps that Nintendo chooses, but you don't see them. It's really scary. Nintendo can do this because their games are good. It's not just some any typical Oreos you can find at any store. The map rotation works due to how the load-outs are handled. So people think this is news. This has been known since the launch. All major reviews focused highlighted the amount of content at launch as a negative. Personally Splatoon has been something I wanted to play since it's reveal last year and one of the reasons I bought a Wii U. It's a brilliant game where mechanics are the main selling point.Sure there are maps I don't like but I either don't play those or adapt different tactics. I think unless you are excited by the concept the way I was when it was revealed you might look at it differently. But I believe that it was made pretty clear from Nintendo and Reviewers that the game won't have much content at launch. If you were in doubt just wait till August, there is no need to be an early adopter unless you are like me. I personally thought this quirky game might have the type of mechanics I've been craving for in an online multiplayer. I could play Port Mackerel for hours in ranked without growing tired of that map. I wouldn't call the game incomplete - I could have easily played 200 hours online with the current content before growing tired of things. I will take a break at some point and when I return there would be a lot of content to catch up on. 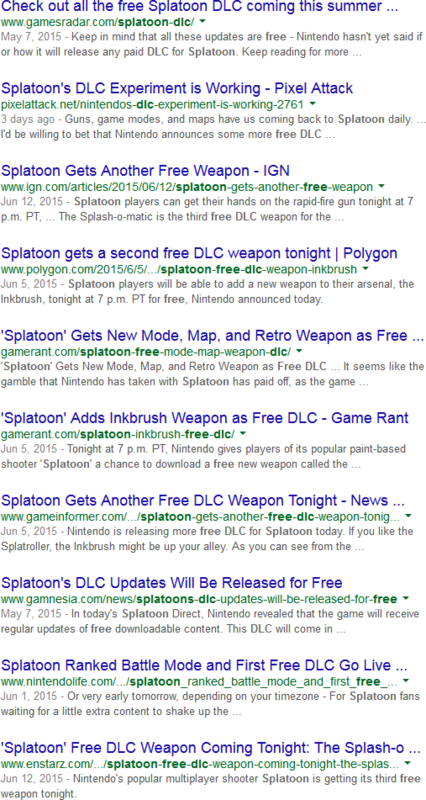 I just don't understand what people are complaining about - everyone playing Splatoon is aware of the amount of content there is for the game. Perhaps some people bought it but are waiting for August to play it, for me playing it with it's current content and more being gradually rolled out is not a problem. I've not paid additionally for that content and was OK with paying $60 for what was released at launch. The dev had made a decision after probably discussing the game launch internally within the company. I think we are only going to see the dev's true intentions when the August update releases. Personally I can't wait till August - just thinking what an organized team could do on this game is making me excited. A lot of people play a lot of PC games with very little "content" A LOT because of the depth of the gameplay. Well I think Splatoon is pretty deep. Yeah, I guess not. I was actually thinking about getting it even though I don't play shooters. I was trying to get a feel for what its all about. I wonder what the COD community would do if Activision started telling them they can only play a certain map online and then in four hours we'll change it for you. I wish we could save costume sets and pick the ones we want to use when the map is selected. Currently it's like this for me, " oh cool, I have some time to play Splatoon!" *I hop on* " great it's two maps I dpn't really want to play with no chance of maps I want to play showing up for a few more hours. Screw it"
"Oh cool! I have some time to play Splatoon." *play for a few matches* "alright, well I'm tired of these maps, I'm off"
It's a silly structure for online play. But have you tried the Red Velvet Oreo's? You call Yoshi anemic, bro? To be fair, there always will be a greater outcry for freedoms taken away then freedoms never given in the first place. That's true, but for people coming from other competitive shooters to it might feel the same.